What if I told you that Kool-Aid is more than just a refreshing, thirst-quenching beverage? To be honest, I don’t drink Kool-Aid very often. I’m more of a Tang fan myself, but who can’t resist a boost of flavor for only 10 cents? There are so many different flavors, (and colors) to choose from! I’m sure everybody has tried Kool-Aid at least once in their lives, and lots of people have some packets of Kool-Aid somewhere in their kitchen cupboards. I found these packets in my apartment hiding on top of my refrigerator. One life-hack I have heard of before is using Kool-Aid to color hair. When I was younger, I tried to color my hair purple, but it didn’t work. Probably because my hair is an asian shade of dark brown… After hours of doing extended research, (browsing the internet,) I found other creative uses for Kool-Aid. So whether your favorite flavor is Grape, Cherry, Lemon, or Orange, I’m sure you’ll find a new and interesting way to use your packets of Kool-Aid! Dampen your finger or a Q-tip, and dip into the Kool-Aid powder. Apply evenly onto lips. A pleasant pop of color and a yummy flavor! Add a pinch of Kool-Aid powder to petroleum jelly to make a flavored lip balm with a hint of color. The basic formula of water + Kool-Aid can also be used to dye hair. However, it’s not permanent, and works better on lighter colored hair. Mix in a few packets of your favorite flavor of Kool-Aid to a batch of tea to add some flavor. Or add some Kool-Aid to Sprite or Club Soda to make flavored soda. A classic childhood favorite. Mix a batch of Kool-Aid, pour it into an ice cube tray, put some plastic wrap on top, place a toothpick in each square, and make mini popsicles. Or bypass the toothpicks to make flavored ice cubes to add some fun to a drink (like tea or soda!). I found this tip online. Supposedly, using a packet of citrus-flavored (Orange or Lemon) Kool-Aid helps clean out a dishwasher or washing machine, getting rid of rust and build-up. The citric acid in the Kool-Aid breaks down the dirt. I got some mixed reactions when I found out if other people tried it out. For Mollymc of Curbly.com, cleaning the dishwasher with Kool-Aid did not work, here’s a link to her results. However, if you still want to see how it’s done, check out WikiHow’s directions. Apparently, the same technique also works for washing machine. But if you want to try this, for either the dishwasher and the washing machine, make sure that there are no clothes/dishes in either contraption. Because I’m sure nobody stores their clothes in the dishwasher or their dishes in the washing machine! Another use for Kool-Aid that brings out the inner kid! The classic formula of Kool-Aid + water can also be used as watercolor paint. Make sure to use paper that can hold water. I have decided to hone in on Kool-Aid’s citric acid abilities and see if cleaning my toilet bowl with Kool-Aid actually works. Here’s the link to where I found the idea. It’s simple enough. Pour a packet of either Lemon or Orange Kool-Aid into the toilet bowl, mix it around with a toilet brush, and let it sit for a few hours or overnight. I actually tried this out for myself. Click here to read all about it. Come to think of it, it’s mind-blowing to think that something originally used as a drink has the capabilities of being a cleaning agent. Using Kool-Aid for lips or for drinks makes perfect sense… but the acid in this drink can clean out a toilet AND is still okay for me to ingest? This is probably why I don’t drink Kool-Aid, let alone the sugar overload that ends up getting added. 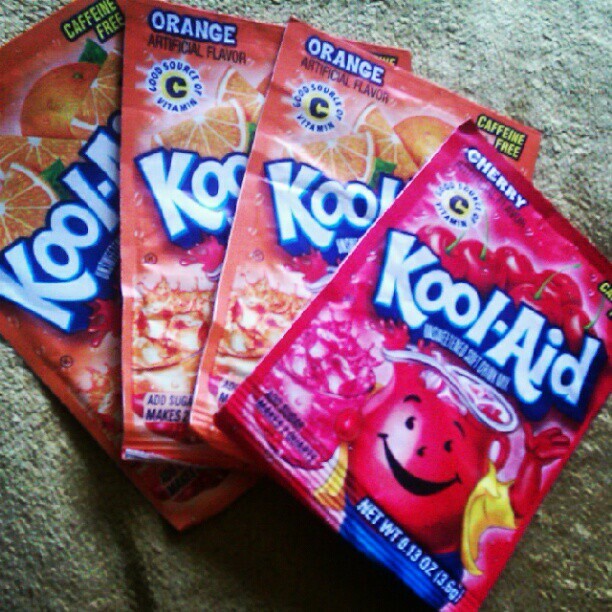 But I’m not going to hate on Kool-Aid. I think that Kool-Aid reminds people of childhood, being care-free, and having fun, a time when something simple as water and sugary powder could bring so much joy to life!